Anyone who has tried to draw the human figure has quickly learned that the hand is among the most complex of the body forms. 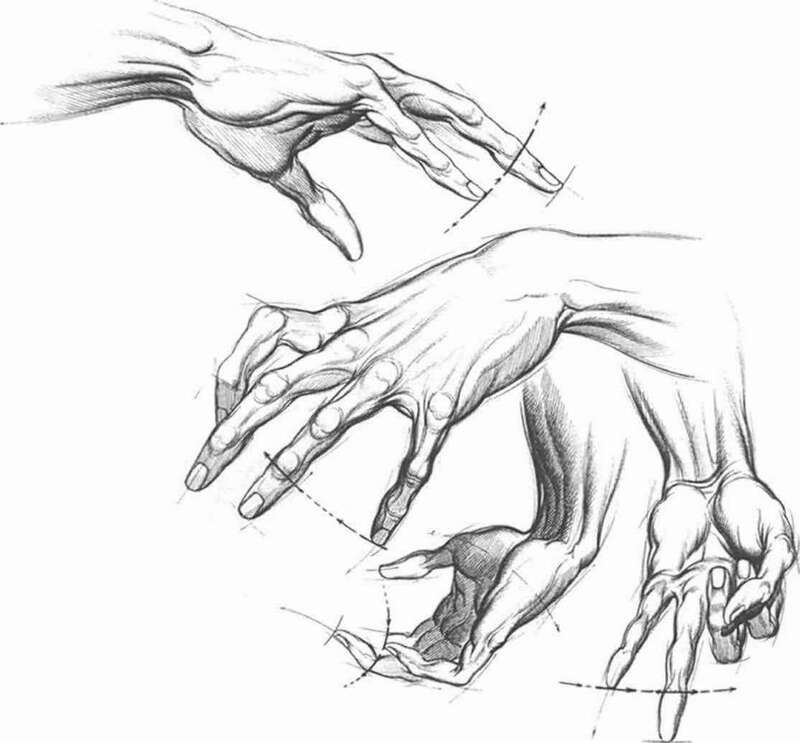 To draw the hand accurately and with precision, you must know how to relate the individual parts to each other and how to unify the separate elements- A knowledge of proportions is necessary in art and should be used as a learning stage to new expressive adventures. 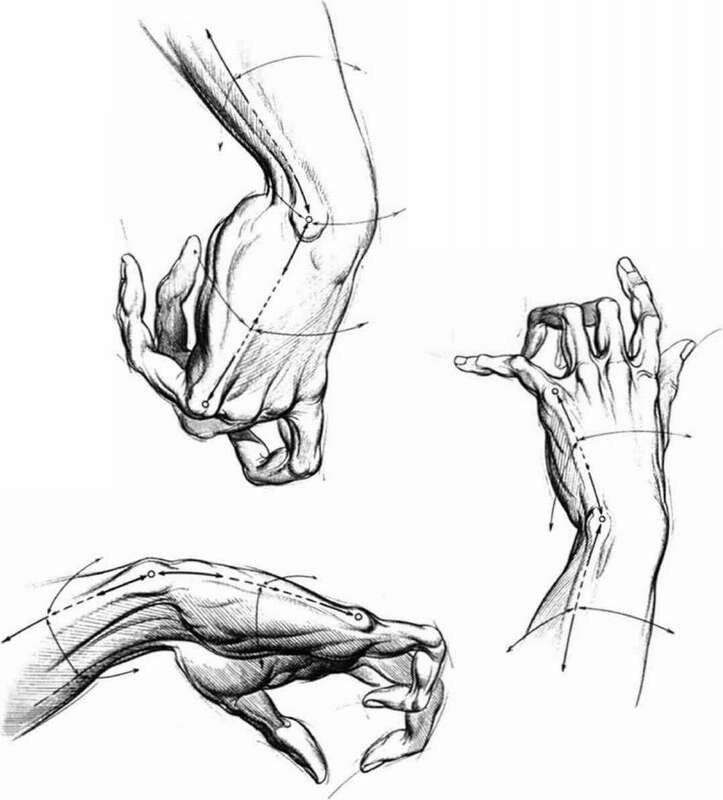 This chapter will introduce essential measuring cues and their use in drawing the hand in correct proportion. Once the interrelated measurements are understood, you can create dynamic and alive hands without needing a model. You will also see the underlying symmetry and unity of the structures of the hand. The palm at its longest point (A it) H) is the same length as the middle finger (B to Fj. Every section of the middle finger is half the length of tlx: one above it. Thus the first phalanx and finger knuckle (B to O is half the length of the entire finger; the middle phalanx and second knuckle fl) to F) is hall the length of the first phalanx; and if the terminal phalan* (D to F> is divided, we have the length of the fingernail (E to F). Other symmetries also exist. The schematic drawing at right shows, the index and fourth fingers to be equal in length. Check this in both draw ings and on your own hand. Also, the lips of the index and fourth fingers terminate at the nail bed of the middle finger. Not all people show these equal lengths exactly, but a large enough majority have (hem to make this a feasible premise. Now note how the end of the linle finger aligns with the knuckle of the terminal phalanx of the fourth finger. The thumb also aligns with the palm and palm knuckles—the index finger knuckle (!) lines up with (he knuckle at ilie midpoint of the thumb (J), and the tip of the thumb lines up with the first phalanx of I he index finger. The drawings here show foreshortened views and emphasize thumb placement. 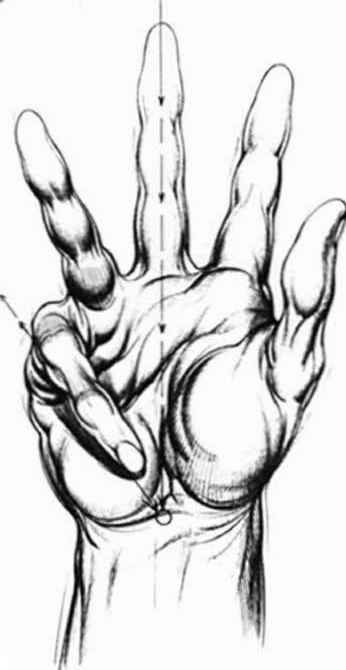 The curved series of arrows indicates how the thumb, in advancing and receding position* in the depth plane, relates to the mid-hand (both dorsal and palmar sides), the palm knuckles, and the mdex finger knocklcs. 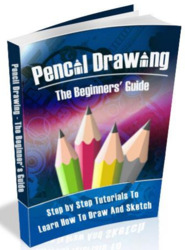 Use of these measuring cucs can help you draw with more ease. Arcs shown by the arrows here point out the relationship of the three long fingers of the hand. The index and ring fmger lengths can be inferred from the mil bed of the middle finger. 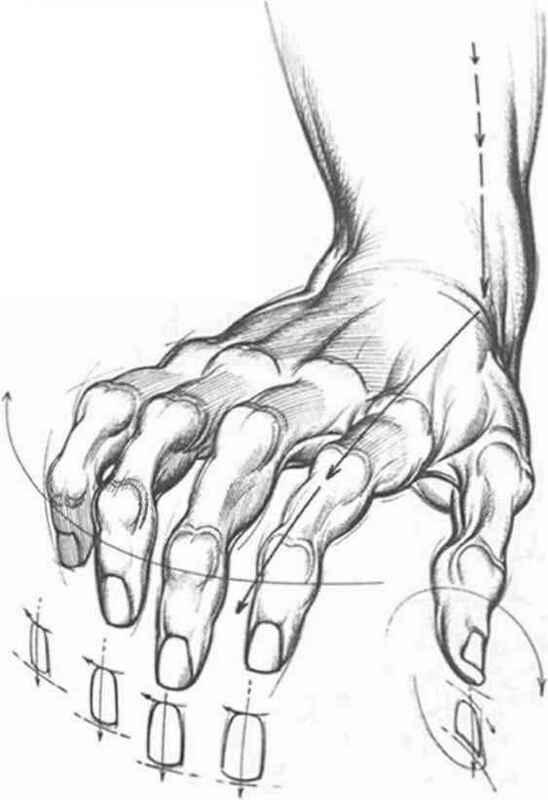 Since these fingers are usually about equal length, arcs from one to the other can be used to determine correct placement of knuckles and finger ends w hen viewed in the depth plane. Note that this works consistently in the variety of actions shown here. LITTLE FINGER MEASUREMENTS The tip of the little finger lines up with the last knuckle of the ring finger, thus finger placement can be easily integrated in all positions when this measuring cue is used. 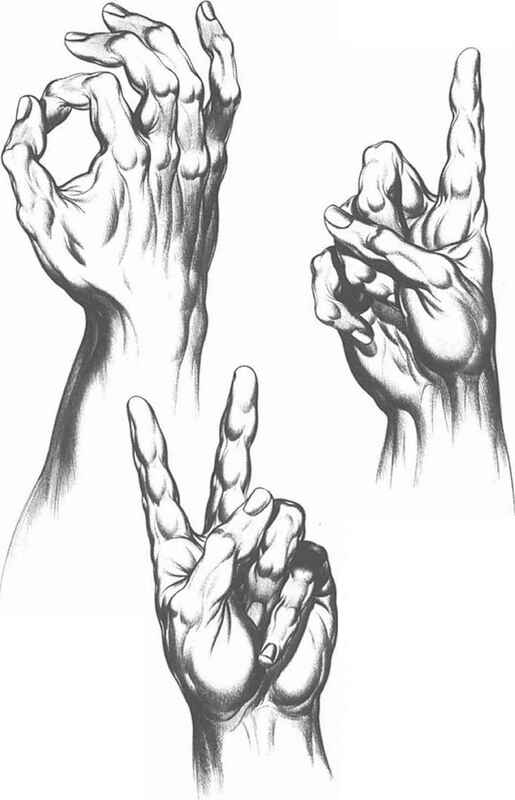 Correct positions of other fingers are based on measuring cues already described in previous drawings. For example, observe the alignment of thumb knuckle with mid-palm in the drawing at extreme right. ANGLE OF ULNA AND LITTLE FINGER KNUCKLE The large palm knuckle on the dorsal side of the hand, from which I he little finger emerges, is directly in line with the ulnar protrusion, the base of the outer bone of the arm protruding at the wiisi. 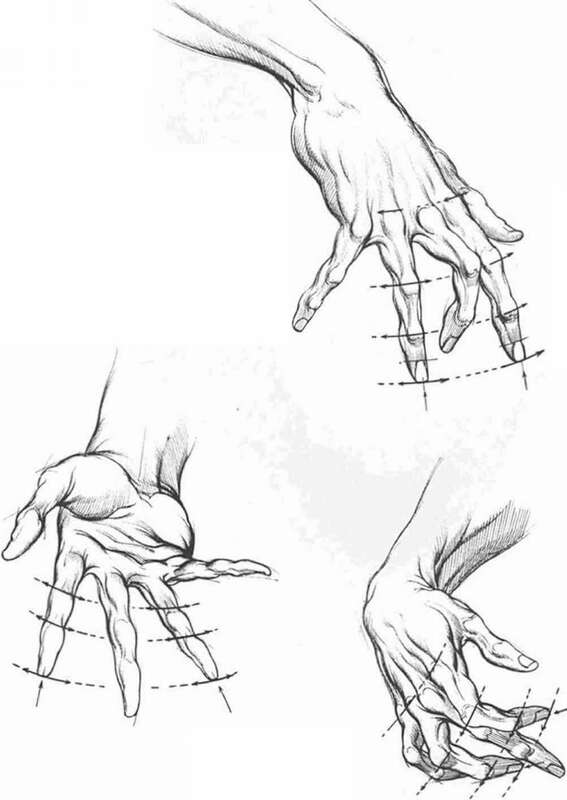 This important relationship marks a transition point between top and side planes of the outside of both hand and arm. This alignment is quite apparent in the side view shown at lower left, but correct placement of these points is less obvious, though essential, when the hand is draw n from angles, as shown in the drawings at upper left and below. The top sketch shows the line marking the side edge of the index finger knuckles and on up the arm. This line defines the transition point between top and side planes of the inside of the hand and arm. It rises high at the wrist and palm and then courscs down to the fingertips. The juncture with the wrist (zero pomt between arrow flows) occurs at the end of the inner forearm bone, the styloid process of the radius. The line of the thumb rises at an angle to meet the line of the index finger at the wrist girdling line. The juncture at the styloid process is invariable. The two lower sketches show how this point of intersection is consistent even in different hand positions and different views. Some of the most difficult views of (he hand are those yrtii from the palm side, especially if the palm and fingertips are in deep space with the thumb in some extended action. The thumb and index finger placement then becomes most difficult, as does placement of the lines from inner and outer arm. In the upper drawing, the thumb has been put in last, after the finger and rear arm lines have been set. Note the ease with which index finger and little finger palm lines relate to tf* contours of (he lower forearm. The thumb insertion ts found by relating it to the wrist girdle arnl index finger juncture (iero point) as described earlier. The lower sketches show how the thumb goes from forward thrust at left to a deeper, upended thrust at right. Also note the arm line positions, especially those on the little finger side. 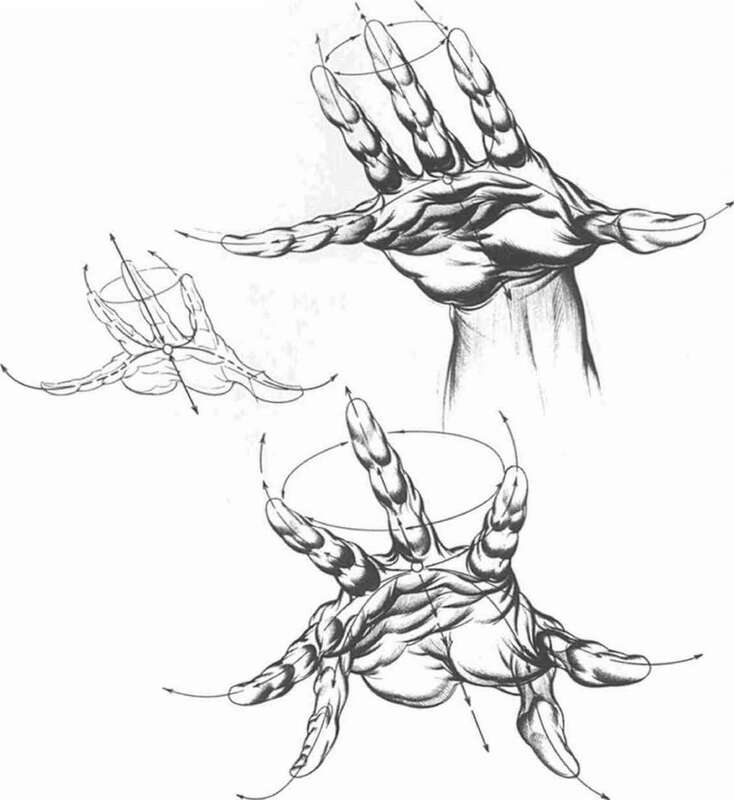 Awareness of the clltpucal spirals of I he hand may produce spontaneous insight into form and can help you organize form when the hand is seen deeply foreshortened or with projected or closing fingers, as in the two drawings here. Note how vitalized the fingers look here. It doesn't mailer at what point you stan to lay in the natural rhythms, beginning with a free sketch first or with knuckle positioning, the sense of this rhythm will help you greatly in your sense of the design. LITTLE FINGER AND THUMB RELATIONSHIPS The little finger and thumb have an affinity for each other. 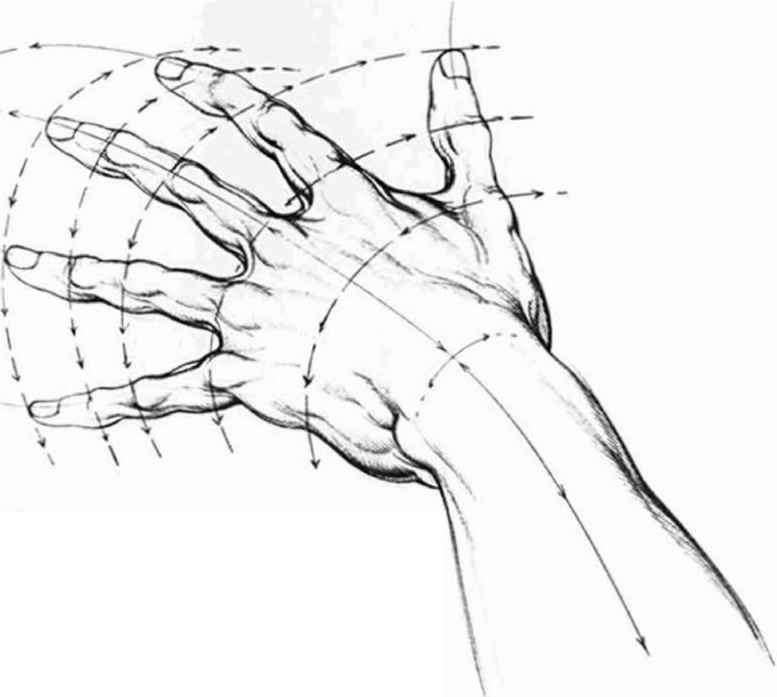 If the palm is open and spread w ide, as show n in the center sketch, and lines arc drawn from the lip of the thumb to the tip of the little finger at the outside edges, these lines wilt be at a 90-dcgrec angle from each other and converge at ihc point where the palm joins the arm (zero point). A line can also be drawn from this point to the end of the middle finger. If the thumb is moved across the open palm, this movement will form a hyperbolic arc to a point of contact with the base of the little finger. The dorsal palm knuckle is directly under the thumbnail on the dor\al side of the hand. The sketch at left illustrates that when the fingers are expressing number three, the thumb crosses and rests on the second knuckle of the little finger» actually lining up with the palm knuckle beneath it, as if the little finger were not in the way. Note that the vector lines from the outside of the little finger and from the outside of the thumb converge at zero point and are perfectly equal in distance from each other. Awareness of this relationship w ill help you in draw ing various hand positions in which the thumb is folded over closed fingers. 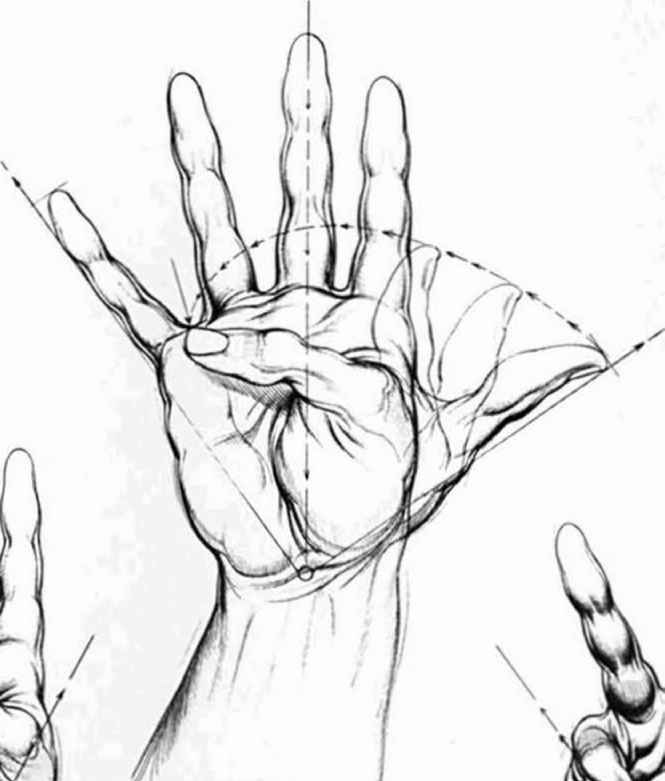 The sketch of open palm at right shows how the little finger can be brought downward across the palm and will almost touch the zero point. This is the only finger which will align with this point. Sf (he lingers are fully outs!retched as shown in the center drawing, there will be a ISO-degree angle between the lip of the tittle finger and the lip of the thumb. If the thumb and little finger are brought together over the midline of the palm, with the other three fingers outstretched, as shown in the drawing at upper left, the fingertips will meet as if both fingers were the same length. 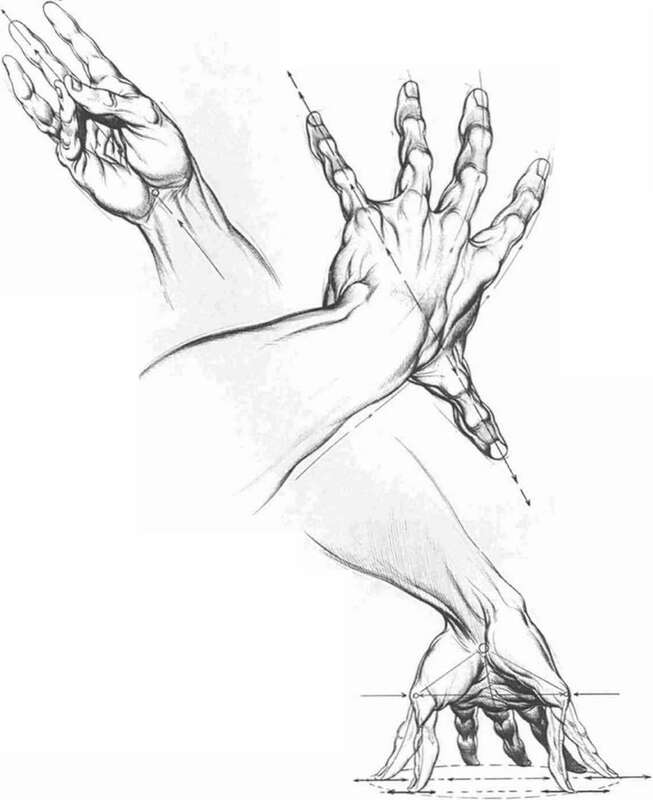 This relationship can also be seen in the sketch at lower right, with the hand shown from a foreshortened rear view Two positions of the thumb and little finger relationship are shown—inner and outer. It the little finger and thumb were to go from flat, horizontal positions up to an erect, closed position, the fingers at any stage would be given equal length. In the upper, deep palmar view, with fingers stressed in full extension, note how the little finger and thumb appear to be lips of symmetrical homs, lying at the end of a great wavclike arc (sec smaller schematic at left). 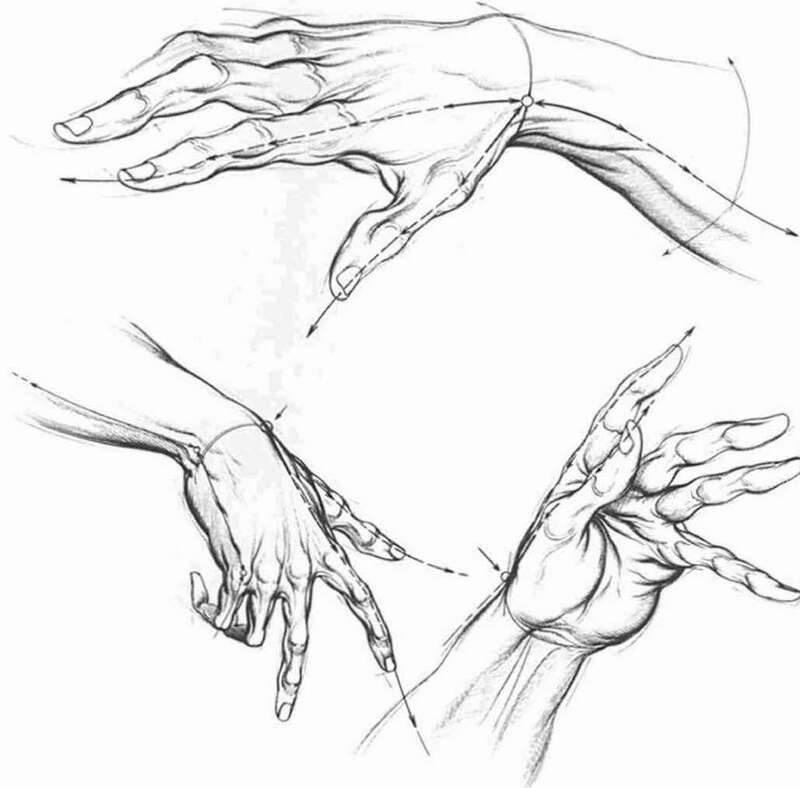 The lower sketch shows fingers more outstretched, with thumb and little finger moving toward each other but still maintain ing the wavclike form. All hands and amis have a special behaworul characteristic which they also share with the legs—thev tend to curve inward This ma> account for the consistent underrurve of the arms mentioned earlier in Chapter I. As the arms move forward in ¡iclion. 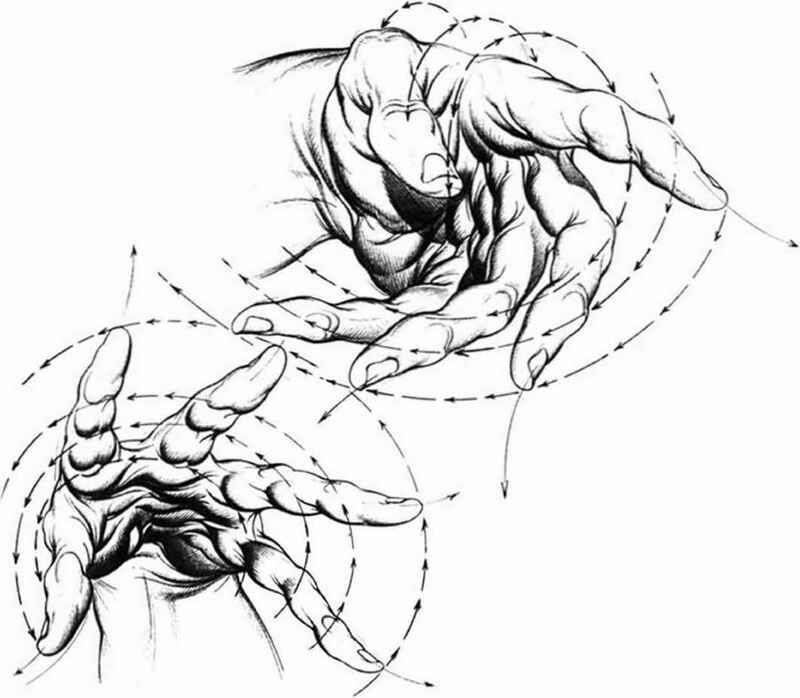 the tension projects the hands outward from the lines of the arms, as shown in the drawing above. Note especially the directional arrows on the forearms and the splayed index finger thrusts. Note in the draw ing below that fingernails of receding fingers rorare from an almost straight-on view, shown by the index finger, to a curse on the little finger that is almost out of sight. The thumbnail, however, rotates according to the action of the hand or the action of the thumb. If the base of the pal™ is level with the chin base, as shown at left, the fingers will reach the brow, and the long middle finger will touch the hairiinc. If the thumb is placed in the inner arm elbow depression, as shown at right, the hand will span from that point to the base of the palm, A knowledge of these proportions will be extremely useful when dealing with the figure as a whole. In a final note on measured relationships, if the hand is placed in side position and laid on the brow, it will fit almost exactly between the hairline and the eyebrows. In some cases, a large hand will also cover the nose root. The palm can also be placed in side position in contact with the nose base, and the side of the palm will reach the base of the chin. These measuring cues can he especially useful when drawing multiple figure compositions. How to draw realistic manga? How to draw action lines? How to draw disney figures proportions? How to draw finger knuckles? 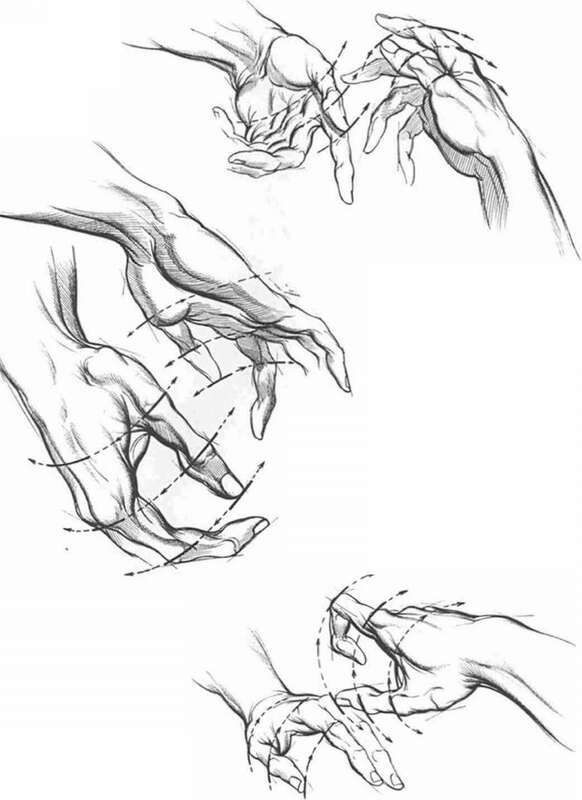 How to sketch a realistic hands? How to draw finger position? How to draw proportions sketch? How to draw realistic sketches? How To Drawing Human Proportions? How to draw realistic fingers? How to draw anime bodies in different positions? How to measure proportions in drawing? How to draw accurate hands? How to draw begging hands? How to draw hands fingers? How to sketch the finger of model? What is the measurement for drawing hands? How to draw human hand poses? How to draw realistic hands touching? How to draw anime outstretched hands? How to draw hands every position? How to draw hands holding each other by fingertips? How to draw realistic hands holding? What are a childs hands measurements in relation to their face? How to draw tumb angle on plam? How to measure with finger in arts? How to measure proportion with finger & thumb? How drawing hands and fingers? How to draw and label a proportion bix? How to sketch hand and fingers? How to draw body proportions sketch? How to draw lines on a human figner? How to draw folded hands? 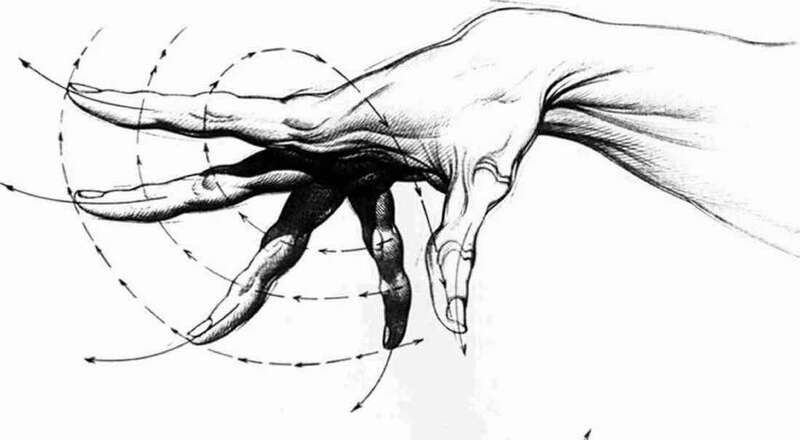 How to draw a hand with nail? How to draw fingers in different positions? How to draw hands fingers proportions? 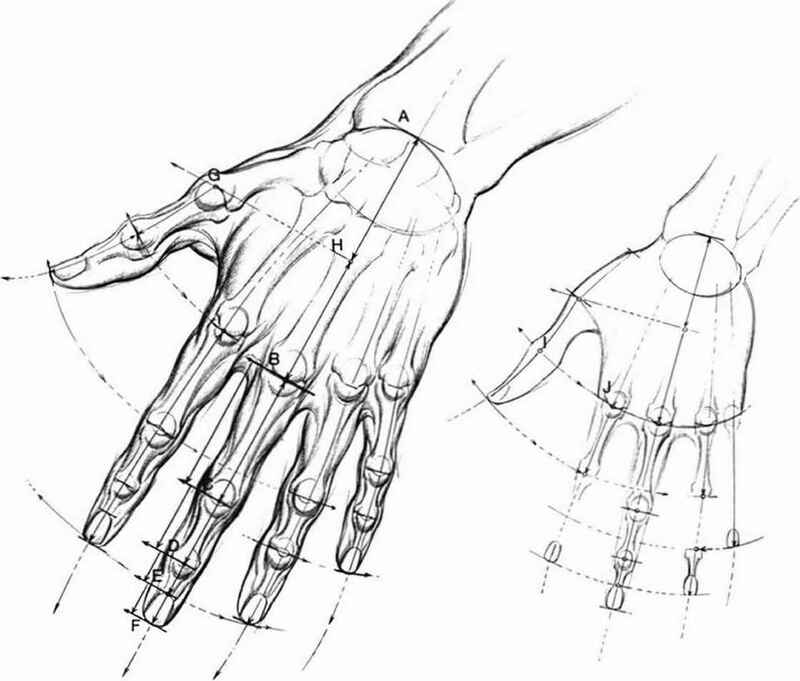 How to measure a hand length for drawing? How to draw hand knuckles? What is proportion and measurement? How to draw outreached arms front view? How to draw a side arm whit hood realistic?